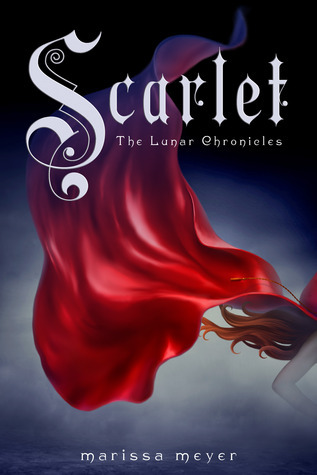 Marissa Meyer's first book in the Lunar Chronicles, Cinder, debuted on the New York Times bestseller list. Marissa lives in Tacoma, Washington, with her husband and their three cats.Visit her at marissameyer.com and facebook.com/lunarchronicles. Scarlet is searching for her grandmother who has vanished into thin air from their farm outside of Paris. As Scarlet makes her rounds, delivering fresh vegetables to nearby restaurants, she meets a street fighter named Wolf. Wolf, is one heck of a man and knows it, but Scarlet, much like Cinder, doesn't have time for such foolishness since she is on a mission to find her grandmother. Bit by bit, she comes across clues about her grandmother's disappearance and ultimately she ends up at the Wolf's door. He decides that he cares more about Scarlet than he does about anything else. This puts them both on a direct path to Cinder and the Lunar Queen. While at the same time in New Beijing, Cinder has made a daring prison escape using her new found Lunar powers and the help of her new side kick and fellow escapee, Thorne. I adored Thorne and his witty rejoinders as they travel the world on his stolen ship, formulating a plan to thwart the Lunar Queen. Cinder get so exasperated with him at times and he is so clueless but at the same time "gets it" and knows just when to get the job done. With the help of the newly restored Iko as the ship's "brains" which reminded me a bit of Hal in 2001, A Space Odyssey, except not as creepy. As Scarlet and Cinder are now on a direct collision course to meet, there are fireworks and explosions galore when the two do come together. I really can't wait for the next installment to see where these two feisty females take us. Prince Kai is still in the story but not as much as in the first. I hope he gets his act together in the next one. I really adore this series and can't believe that Meyer worked in another fairy tale so seamlessly and with such wit. Parents: there is some violence, kissing and a bit of language. Now, when does the next one come out? I have this in reserve at the library. You've got me really excited to read this. Thanks for the great review. Me too! (seems the easiest thing to say). Just read it, loved it as well.